Blist is an interesting cross between a spreadsheet application and an interface to a proper database. The goal (I believe) is to allow mere mortals to create and share simple databases on the Web. 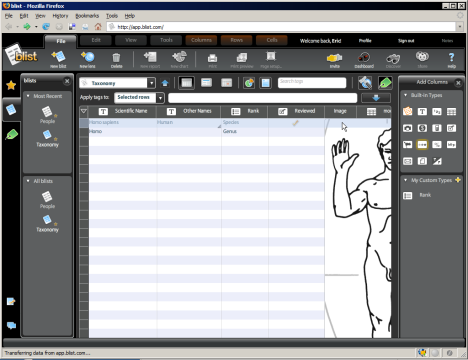 Upon logging in and creating a “blist”, you are presented with a spreadsheet-like view. You then drag and drop data types onto the spreadsheet to create columns. “Lenses” can be created to get non-tabular (and filtered) views of your data. Data can be entered directly both in the table or in the “lense” views. There are options to share and discuss “blists” – however these don’t seem to be implemented yet. Blist is still in a very early stage. Following are some comments, based on my initial impression. In addition to the standard data types (text, numbers, dates etc) there are lots of unusual but useful data types such as email addresses, images, and star ratings. Columns (unlike in a normal spreadsheet) can be set to allow multiple values in a single “cell” (possible, but cumbersome to implement with a normal database). You can easily create “custom types” a.k.a. “pick lists” or enumerations. It is possible to group/nest columns one level deep, creating a “blist-in-a-blist”. Blist (unlike a normal database) doesn’t prevent invalid values in fields that expect a certain format. But (unlike a normal spreadsheet) invalid values are highlighted. If non-technical users are the main audience, it may be worth thinking about making the interface less intimidating. Too many buttons and controls! Support for undoing actions (and fewer prompts). Support for changing the data type of a column (e.g. from number to string). There is a nice calendar control for entering dates. Unfortunately it can’t be bypassed – if you want to enter an old date you need to go back in time month by month… The money data type is nice, too, but seems to be USD only. Some of the data types muddle the distinction between data type and display. For example, is a checkbox really a different data type than a boolean – or is it just another way to display boolean values? If the query builder showed a preview of the results, this would save some tedious back and forth when building queries. Speaking of search: Where is the quick search? Should be able to link blists to each other (one of the killer features of relational databases)! Support copy-pasting single (and multiple) cells. While Blist isn’t the first effort to do spreadsheets or databases on the Web (think Google Spreadsheet or Freebase), the way it combines the best features from both worlds seems new (to me, at least). Will be interesting to see how the “social” features are implemented – and of course if their infrastructure manages to scale (especially once they enable the data import feature and people start dumping existing collections into Blist)! Import: Support tab-delimited files in addition to CSV? Auto-detect e.g. numeric columns? Support creating custom types during import? Need to know a bit more than “There was a problem uploading your file” if something goes wrong! Charts: This will be useful once aggregates are supported! Can the generated charts be copy-pasted into e.g. PowerPoint? Search: Don’t need substring matches – but more speed! Highlight matches? Support for multiple search terms? Searches across several blists? Sharing: Will there be a way to make blists public, and link to them?